The two-hour ABC sendoff will answer the biggest question: Who murdered Lila? Fans of “How to Get Away With Murder” will finally find out who killed Lila during the show’s two-hour season finale on ABC Thursday. As we’ve come to expect from the Shonda Rhimes-produced drama, Nowalk warns that the roller coaster ending will be jam-packed with twists and turns. “You just have to pay close attention and not get too distracted because it goes by really fast. There are going to be several jaw-dropping moments,” said Nowalk. 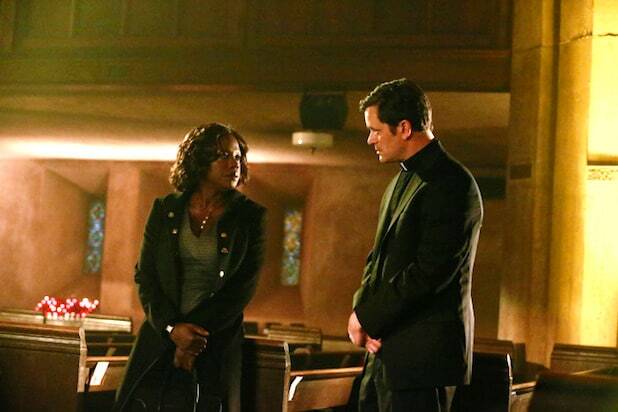 But, it’s Sam’s murder that has Annalise struggling to stay focused. Not only is she complicit in her husband’s death — she’s also framed her lover, Nate (Billy Brown), for the crime. Meanwhile, Connor (Jack Falahee) and Oliver (Conrad Ricamora) will take their relationship to the next level, after a drunk Oliver tells Connor those three dreaded words before passing out. While Wes (Alfred Enoch) and Rebecca (Katie Findlay) grow further apart, Wes and Annalise are getting closer. Watch some of Rhimes’ most outrageous moments of 2014 here. “How to Get Away With Murder’s” season finale airs Thursday at 10 p.m. on ABC.